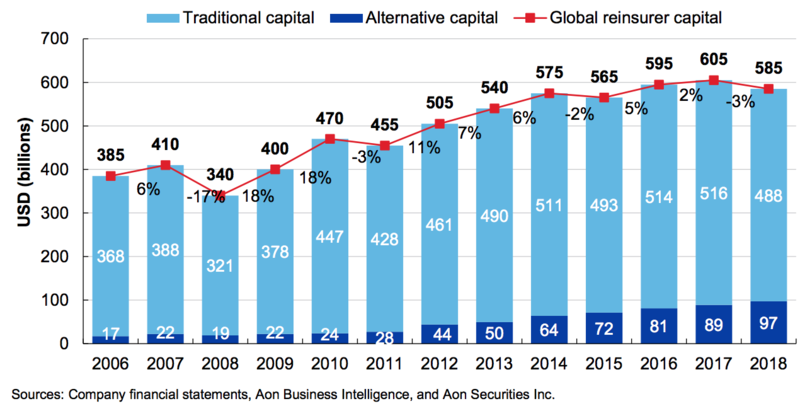 Global, dedicated reinsurance capital declined by 3% in 2018 ending the year at $585 billion, driven by a fall in traditional capital as the alternative sector grew once again, according to Aon’s 2019 Reinsurance Market Outlook. From the end of 2017 to the end of 2018, traditional reinsurer capital declined by 5%, or $28 billion to $488 billion, driven mostly by a number of macroeconomic factors, says insurance and reinsurance broker Aon. These include higher U.S. interest rates, the strengthening of the U.S. dollar, and also a stock market correction in the final quarter of last year, with a change to accounting significantly impacting company results. The reduction in traditional capital throughout the year was somewhat offset by the continued, albeit slowed entry of alternative, or third-party reinsurance capital. According to Aon, alternative capital increased by 9%, or $8 billion to $97 billion in the period, mitigating the negative impacts of macroeconomic factors on the capital level of the global reinsurance market. Aon notes that the above chart shows the total of alternative capital gross of trapped collateral, as a result of the catastrophe events in 2017 and 2018. Insured catastrophe losses over the last two years exceeded $240 billion, but despite this, Aon highlights that global reinsurer capital remains resilient and in fact, excess capacity continues to exist in spite of greater demand for reinsurance solutions, globally. “The proportion of the losses accruing to reinsurers has been relatively low, given the profile of the underlying events and the high retentions carried by large primary insurers. Furthermore, the reinsured portion has been spread around a much broader pool of investors than has historically been the case,” explains the broker. Ultimately, and supported by the increased utilisation of the capital markets, Aon notes that global reinsurers remain strongly capitalised on a risk-adjusted basis. “They utilize the capital markets to manage their gross exposures, carry significant budgets for net natural catastrophe losses and rely on investment returns to underpin their earnings. As a result, they have generally been able to trade through recent events without capital impairment,” says Aon.